Fax to Email solutions are the perfect way to streamline your business communications. Your fax correspondence is seamlessly incorporated into your email, meaning that faxes can be viewed and forwarded from anywhere in the world where an internet connection is available. The need for dedicated phone lines and bulky fax machines is also eliminated, as well as unnecessary wastage of office consumables like paper and ink. 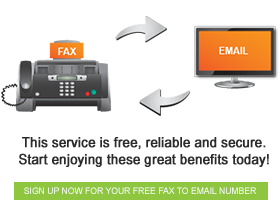 FaxFX Fax to Email services are available absolutely free of charge. Once you are assigned a fax number, it is yours to keep for life, even if your company should relocate. The only requirement to keep your Fax to Email account active is that you receive at least 1 fax a month. Our automatic archiving and storage service makes keeping track of faxed documents safe and simple – all faxes are stored indefinitely and are available to be viewed or printed by you whenever necessary. Faxing with FaxFX is as simple as receiving or sending an email. When you receive a fax, it appears in your inbox as either a TIFF file or a PDF document, compatible with most operating systems in use today. Faxes can be viewed, printed or forwarded instantly and are automatically archived.